Basil: What’s not to Love? Basil, easily recognized by its fragrant, green, oval-shaped leaves, makes an appearance in many foods including pasta, salads, sandwiches, cocktails and more. This delicious herb is best known as the star ingredient in pesto, a thick paste made from basil, pine nuts, oil, and parmesan cheese. First cultivated in India thousands of years ago, basil has since been incorporated into a variety of ethnic cuisines from Italian to Thai. Basil oil, extracted from the leaves of the plant, is a natural antimicrobial and can kill or inhibit the growth of bacteria. Scientists have shown that basil oil reduces the growth of a number of food-borne bacteria species including cholera (V. cholera) and E. coli O:157:H7 (3-5). Given recent outbreaks of food-borne illnesses, cooking with natural ingredients such as basil oil which inhibit bacterial growth is a great way to make food safer as well as tastier. Although basil shows promise as a natural antibacterial agent, it’s important to note that most scientific studies looking at this question have been done in laboratory settings using high doses of basil extract. The effect on bacterial growth observed by home cooks using smaller amounts of basil or basil oil is not clear. In addition to its health-promoting qualities, basil is easy to grow in a sunny windowsill or garden. A handful of basil leaves can add a delicious flavor to a wide variety of dishes – a few ideas are listed below! 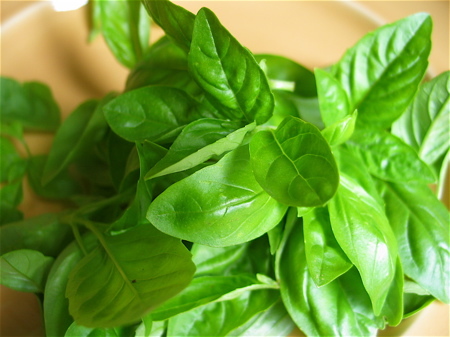 – Choose fresh basil over dried basil when possible, as fresh basil contains the basil oils. – Look for vibrant, green basil leaves. Store fresh basil in the refrigerator; fresh basil can also be frozen. 1. USDA National Nutrient Database for Standard Reference. Available at: https://ndb.nal.usda.gov/ndb/foods/show/262?fg=&man=&lfacet=&count=&max=&sort=&qlookup=&offset=&format=Stats&new=. Accessed June 1, 2012. 3. Elgayyar M, Draughon FA, Golden DA, Mount JR. Antimicrobial activity of essential oils from plants against selected pathogenic and saprophytic microorganisms. J Food Prot 2001 Jul;64(7):1019-24. 4. Biljana Bozin, Neda Mimica-Dukic, Natasa Simin, and Goran Anackov. Characterization of the Volatile Composition of Essential Oils of Some Lamiaceae Spices and the Antimicrobial and Antioxidant Activities of the Entire Oils. J Agri Food Chem 2006; 54(5): 1822-1828. 5. Sánchez E, García S, Heredia N. Extracts of edible and medicinal plants damage membranes of Vibrio cholerae. Appl Environ Microbiol. 2010 Oct;76(20):6888-94. Epub 2010 Aug 27.
https://nutrition.org/wp-content/uploads/2017/10/basil.jpeg 750 1125 asnutrition https://nutrition.org/wp-content/uploads/2016/10/asn-logo-2.gif asnutrition2012-06-19 10:12:252017-10-26 10:12:50Basil: What’s not to Love? Nutritional Interventions in Treatment of Major Depressive Disorder Added Fiber: The Answer to Our Weight Problems?